Looking for a 30-minute weeknight fish recipe? 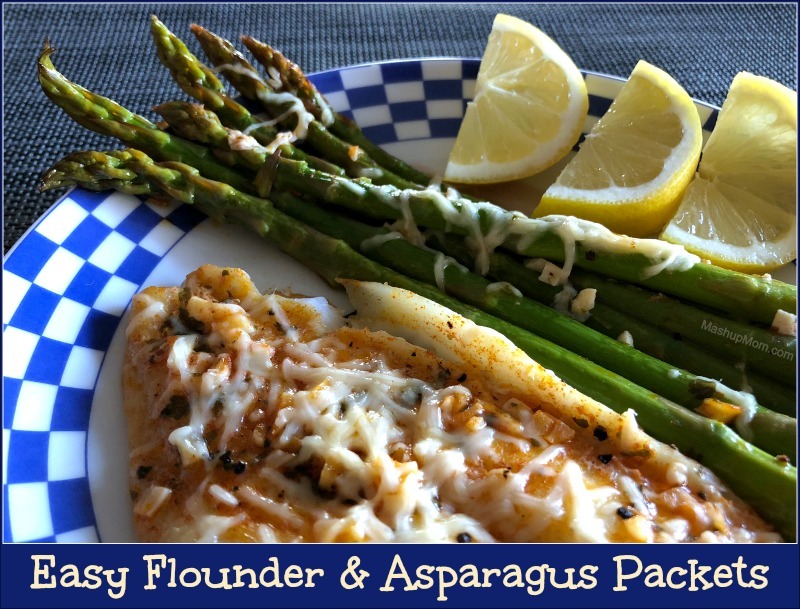 These Easy Flounder & Asparagus Packets give you both a protein and a veggie in one simple dish, but since they’re on the lighter side you’ll want to bulk things up by adding cooked rice (or riced cauliflower) or potatoes plus some fruit on the side in order to fill out a complete meal. Thaw the flounder, if using frozen, and preheat oven to 400 degrees. Combine the melted butter, juice from half of the lemon, minced garlic, pepper, parsley, and smoked paprika in a small bowl. 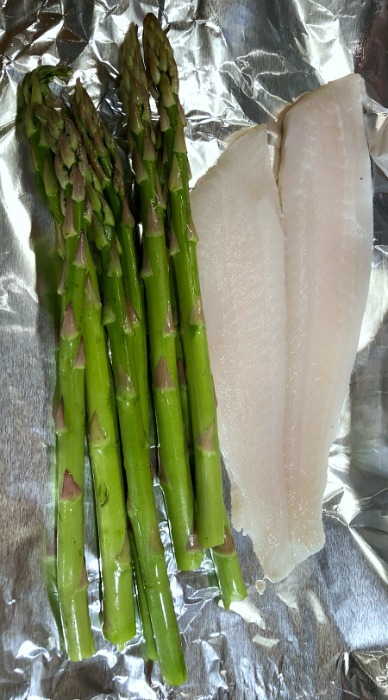 Cut one large piece of foil for each fillet, leaving enough room to fold over both fish and asparagus. Divide asparagus and fish fillets evenly, then place one fillet and a few spears of asparagus side-by-side in the center of each piece of foil. Spoon the seasoned garlic butter mixture evenly over the flounder & asparagus. Fold the foil over each packet and seal it tightly across the top, so that none of the butter leaks out. 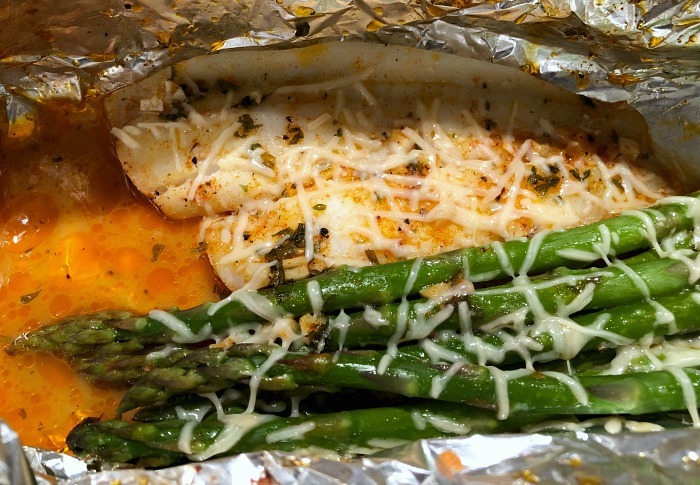 Place packets on a rimmed baking sheet and bake at 400 degrees for 15 minutes, or until fish is cooked through and flakes evenly with a fork, then open foil and sprinkle Parmesan evenly across the fish and asparagus. Return to oven and broil on high with the foil open for 2 minutes to melt the cheese on nicely, then squeeze on additional lemon juice to taste (it really brightens up the flavor!). Serve the fish and asparagus with its own sauce over either rice, or riced cauliflower. Note: If you can’t find flounder, another firm white fish will do — I’ve also made this with pollock and it came out great. If you don’t choose to bake in foil you should also be able to use parchment paper in this recipe; just be sure to seal as tightly as possible with the seam on top to avoid the butter leaking out. I added the Parmesan at the end rather than cooking it in with the fish and asparagus, just so that it wouldn’t stick to the inside of the packet. …Here’s a simple and savory option! 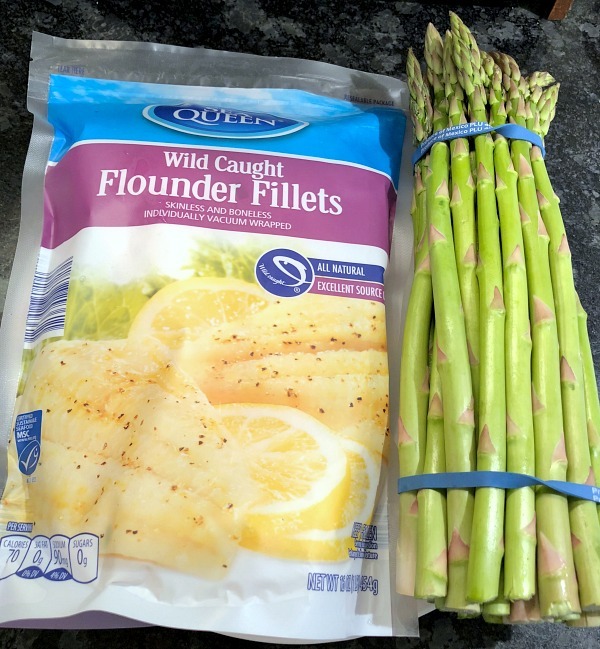 Sorry, I couldn’t resist, but: Easy Flounder & Asparagus Packets are naturally gluten free and low carb (if you serve them over a rice alternative instead of with rice or potatoes). The Parmesan, spices, and lemon garlic butter here work together to enhance the flavor of this mild whitefish, while just a little squeeze of fresh lemon at the end kicks everything up a notch. 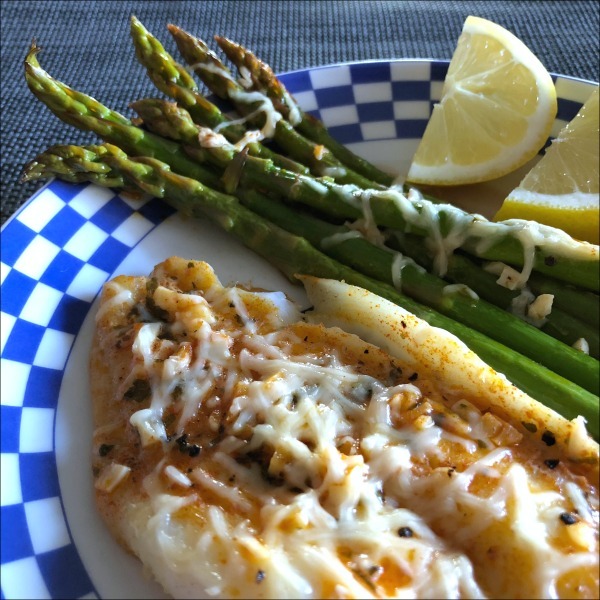 If you can’t find flounder, you can substitute cod in this easy baked fish recipe — but note that flounder fillets tend to be thin, like mine were here, so thicker fish may take a bit longer to cook through. 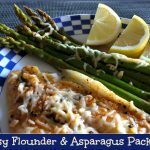 These Easy Flounder & Asparagus Packets give you both a protein and a veggie in one simple dish; just add some cooked rice (or riced cauliflower) on the side to fill out a complete meal. Cut one large piece of foil for each fillet, leaving enough room to fold over both fish and asparagus. Divide asparagus and fish fillets evenly, then place one fillet and a few spears of asparagus side-by-side in the center of each piece of foil. Spoon the seasoned garlic butter mixture evenly over the flounder & asparagus. Fold the foil over each packet and seal it tightly across the top, so that none of the butter leaks out. Place packets on a rimmed baking sheet and bake at 400 degrees for 15 minutes, or until fish is cooked through and flakes evenly with a fork, then open foil and sprinkle Parmesan evenly across the fish and asparagus. Return to oven and broil on high with the foil open for 2 minutes to melt the cheese on nicely, then squeeze on additional lemon juice to taste (it really brightens up the flavor!). Serve the fish and asparagus with its own sauce over either rice, or riced cauliflower. Note: If you can't find flounder, another firm white fish will do -- I've also made this with pollock and it came out great. If you don't choose to bake in foil you should also be able to use parchment paper in this recipe; just be sure to seal as tightly as possible with the seam on top to avoid the butter leaking out. I added the Parmesan at the end rather than cooking it in with the fish and asparagus, just so that it wouldn't stick to the inside of the packet. I made this last night. I will definitely be making this again. I was so delicious! My entire family loved it. It was very simple to make too. Thanks for posting this recipe!!! First time making fish and this recipe made it a success! Thank you.